Hammer Toes is a condition wherein there is contracture of the proximal interphalangeal joint (usually in the second toe, but sometimes the third toe). It is extended at the metatarsophalangeal (MTP) joint, flexed at the proximal interphalangeal (PIP) joint, and extended at the distal interphalangeal joint. Patients may feel pressure against the shoe and under the metatarsal head, particularly the second toe, which is often caused by the retrograde pressure on the big toe. Patients complain of pain felt on the dorsal aspect at the PIP joint of the hammer toe itself usually due to a corn/callus that has developed. Once this happens, it is painful to wear regular shoes. A Hammer Toe may be caused by improperly fitted shoes or a dropped metatarsal head which presses on the flexor tendon (flexor complex – the group of muscles running on the plantar surface of the toes). This pressure causes the proximal phalanx to remain dorsiflexed, and the toe becomes “hammered.” Some other causes are diabetes, arthritis, neuromuscular disease, polio or trauma. 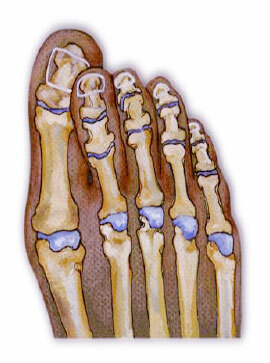 First push up on the plantar surface of the metatarsal head and see if the toe straightens out. If it does, then an orthotic could correct the problem, usually with a metatarsal pad. 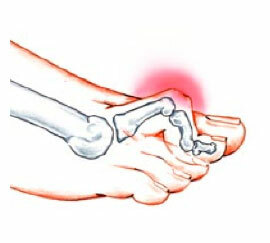 If the toe does not straighten out when the metatarsal head is pushed up, then that indicates that contracture in the capsule and ligaments (capsule contracts because the joint was in the wrong position for too long) of the MTP joint has set in and surgery is required. Orthotics are required post-surgically.